Your debt to income ratio is a pretty big factor in determining your credit score. The biggest factor is still whether you pay your bills on time, but your debt to income ratio or DTI as it’s commonly known, tells creditors if you can afford more to pay back more debt. You might have thought your credit score just depended on whether you pay your bills on time; but it is so much more! The formula for determining credit scores is a closely guarded secret and a variety of factors comprise your total score. Some of the factors include age, length of time at current residence, number of open accounts, available credit on accounts, and many other factors. 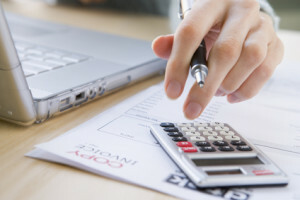 Some factors are beyond your control, but debt to income ratio lets potential creditors know that you are living within your means and you have enough money after housing expenses and other credit payments (like car loans, child support, and credit cards; things that you have to pay) to pay back their loan. Your DTI can be expressed in 2 numbers. The first is called front-end debt ratio; it is your housing expenses divided by your gross income. If you live in an apartment or rent a house, that’s your rent payment. If you own a house that number includes your mortgage, property taxes, insurance, and maybe even homeowner’s association fees. Debt to income ratio means your debt is relative to your income. In this scenario, the housing cost is $1,500. So the debt to income ratio is $1,500/$5,000=30%. Back-end debt ratio is housing costs plus credit payments. So in this scenario it is $1,500+$500+$500 or $2,500/$5,000=50%. Both numbers are expressed together as 30/50. 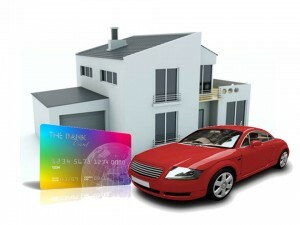 What ratio is attractive to lenders? Bank of America recommends keeping you back-end debt to income ratio at or below 36%. If your number is higher than this, the bank recommends making higher monthly payments to reduce your debt faster and avoid taking on new debts. Another option is to make more money. Increasing your income will lower the percentage of your income that you are using for expenses. 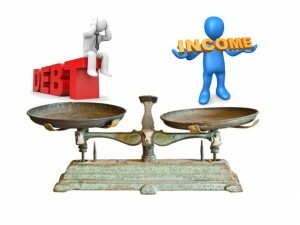 Debt to income ratio means your debt is relative to your income. Their back-end debt to income ratio is $2,500/$10,000=25%. Whereas you probably won’t be able to get a loan with a DTI of 50%; your neighbor will definitely get a loan even with the same amount of debt and the exact same housing cost. His DTI is only 25% so lenders know he has plenty free cash to pay back his debts. If you are looking for an apartment or a house, or if you’re wondering if you should put that big purchase on a credit card, use the debt to income formula backwards. Say you want to keep your DTI at 30%; multiply 30% or .30 by your income (we’ll use $5,000). .30 x $5,000=$1,500 So, if you want to keep your DTI at 30% you only have $1,500 to cover housing, credit payments, and car loan. Keeping your DTI low has a positive impact on your credit score and is one of the main factors used by banks in approving you for a loan. Low debt to income ratio does not mean that you can only spend 36% of your monthly income; it just means that 36% of your income can’t be spoken for. Even though you may pay $400 a month on credit cards, the minimum payment (the amount you have to pay to avoid defaulting) is only $200. So when calculating your debt to income ratio use $200. Keeping your DTI low is also important in case you have an emergency that you have to use your credit card for. Just because the credit card company increases your limit does not mean that’s how much you should spend. Keep your debt to income ratio low to be approved for loans, credit cards, or even a mortgage.